Our instructors hold certifications in group fitness, personal training, yoga, Pilates or water aerobics and are also specially certified in pre/postnatal fitness by our own national Oh Baby! Fitness Pre/Postnatal Training. Oh Baby! Fitness follows American Congress of Obstetricians and Gynecologists (ACOG) guidelines in every class. If you'd like to teach Oh Baby! 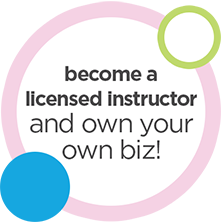 Fitness exercise classes in your town, check out our national licensing program.